A gluten-free and vegan Sunny Spring Pea & Basil Pesto made with spring peas, fresh basil, mixed greens, sunflower seeds, garlic, and lemon juice. This delicious pesto is easy, healthy, and DELICIOUS! 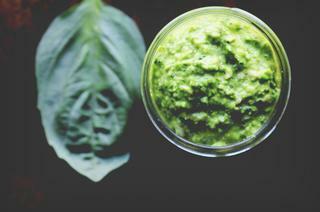 I adore pesto; and this Vegan Spring Pea and Basil Pesto is no exception! I love this pesto as a sandwich or wrap spread; and on chickpea pasta -- but the possibilities are endless, really! I look forward to hearing how you love to use it, too! A healthy, fresh, easy, and delicious Sunny Spring Pea and Basil Vegan Pesto made with sunflower seeds, mixed greens, fresh basil, peas, and lemon juice. Gluten-free, too!